I have looked online for Ladybug brand clothing. Do you perhaps mean Vera that used a ladybug logo? I sure have run across some cute ladybug themes looking for you. I may have to buy me something with ladybugs. I know I have heard of Villager also. Perhaps some of the dealers here have some. Thanks so much for the reply! The label Ladybug is not by Vera. I've attached an image of the label for you to see. Ladybug was the sister, junior line to Villager in the 60s. Thanks so much! I remember wearing my mom's Villager sweaters from the 60s during my first foray to vintage in the 80s. Sadly I don't have them any more. They were quite preppy and as I recall she had bought them at an upscale Philadelphia store. hi northstarvintage! thank you so much for the reply! my mom worked for ladybug outside of philadelphia in the 60s, in plymouth meeting. thanks so much for the luck! i'm hoping something turns up soon! Susan - I am your mother. We would sometimes button those sweaters up and put them on backwards and wear them with knee socks. Of course, with penny loafers... Villager was THE shirtwaist dress to wear. They had full skirts and came with stretchy belts, cute prints and Peter Pan collars. I vaguely remember the Ladybug label. BonniesVintageClothesLine, The Vintage Merchant, cmpollack and 2 others like this. Small world! She lived in Jenkintown and I wouldn't be surprised if she bought them at Plymouth Meeting (pre-mall days). I wish I still had those sweaters. YES Amanda - she wore them backwards! Here's a pic of my mom from that era. BonniesVintageClothesLine, Jenny, cmpollack and 3 others like this. I am your mother, too! 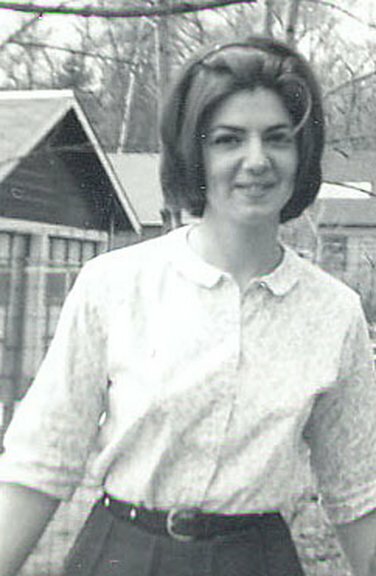 This is me in 1964 wearing a Villager blouse. I probably had on penny loafers and knee socks! I do not have this blouse or the belt or the skirt or the headband, etc. but I remember it! BonniesVintageClothesLine, morning-glorious, Jenny and 4 others like this. Wow! Thank you to everyone for sharing your photos! I will have to find one of my Mom. If anyone has any leads, please keep me updated! Thanks again!!! I remember this brand from the late 60 early 70s. It was The store and brand to wear along with Capezios and Letisse handbags. I will have to look thru my inventory. Oh my gosh Linn - that photo! You and mom could have been sisters! Thank you for sharing. Hi Anothertimevintageapparel! Yes! My mom wore her Capezios, too! And Pappagallos as well! Thanks for looking through your inventory! I appreciate it! I cannot believe it but stumbled across a Villager madras jacket this week. Thank you for this thread. Am I imagining it or did the Ladybug shirtwaist dresses come with little stick pins on the collar that were bugs or turtles or frogs? It seems like they did, and if so, I have several of those. I too was one of those wearers of Ladybug and Villager. Yes yes!! It was a ladybug! I have one!! Just wanted to bump this post...I hope that's okay! I'm still looking! Thanks so much for your help, everyone. foofoogal and The Vintage Merchant like this. Here's a pic of my mom from that era. Susan, i want your mom's SHORTS! cmpollack and poppysvintageclothing like this.